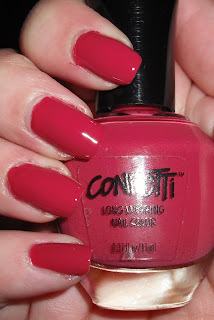 A few weeks ago I reviewed the new nail polish brand at CVS called Confetti. I didn't give them the best review. I thought they had some good points and some bad. I was reading other peoples reviews and many people had great things to say about them so I decided I'd give them another go. Here are the ones I bought. I'm also adding closeup swatches of these colors. I think I'm going to be doing this from now on with all my polishes. Please let me know if you don't like this! Dressed to the 9's is a brick red with gold shimmer throughout. This is a great color this a color I've been looking for a long time, but no other color I picked up seemed to work out as well as this. I love reds with gold in them. It has to be one of my favorite combinations. Let me just say I am smitten with Smitten. This is a winner polish! It is a gorgeous deep sapphire blue with flecks of red,blue, violet, and silver micro glitter. You cannot go wrong at $2 with a polish that is this beautifully unique! 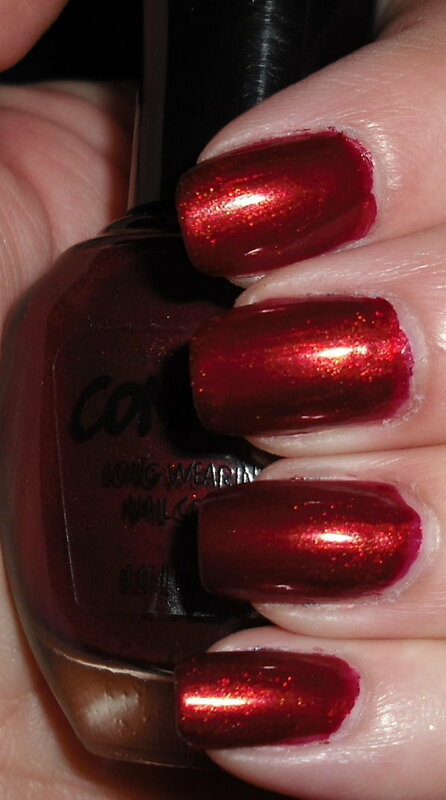 I'm showing this one a little different because this is definitely a layering polish. It's a clear base with blue/green iridescent glitter. From L-R it's on top of NYC Fuchsia Shock, Milani Fresh Tea, Color Club Chelsea Girl, China Glaze Spontaneous, Sally Hansen White Tip, & NYC Black Lace. It is probably better to enlarge this one. It's a pretty layering glitter. I like glitter ones like this because it makes me think of sugar coated sweets that have the crystal sparkle quality to them! 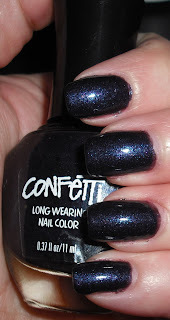 I'd have to say with these polishes I got my opinion of Confetti hasn't really changed. I did have to look at the brushes first before I purchased them and I definitely did see some more wonky brushes. The formulas on all these with the exception of Last Dance were alright. The color Smitten was real winner and I'm sure there are few others too. However, I still think their selection is pretty lacking. I'd have to say with majority of their polishes I already have color similar or a dupe of them. I think Sinful Colors is better with their selection and quality, but it's nice to have CVS brand polish at the same price point as Sinful Colors. I think it's all matter of taste and what colors and brushes you're getting! Anyone else get some Confetti polishes since my last post? What is your opinion on them? I passed them at first and went back for them and most were gone so I only got one. I haven't swatched it yet but its really pretty in the bottle (purple pizzazz). 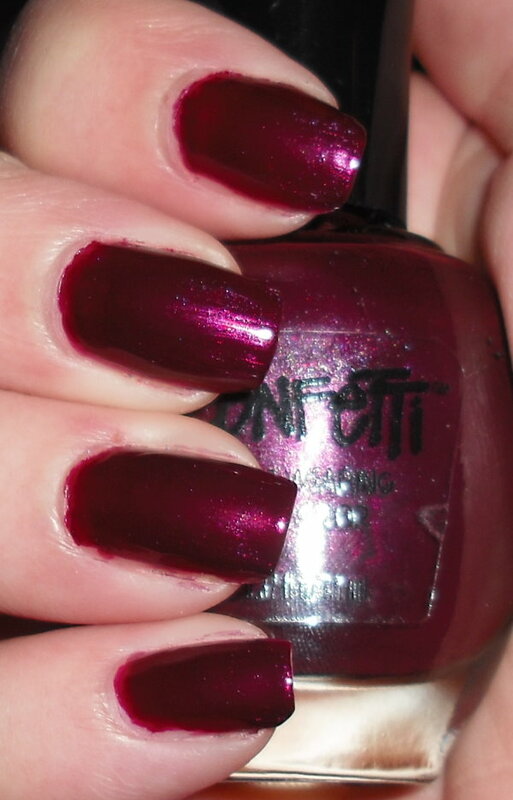 Smitten & Just Dancin are gorgeous on you! By the way, Steph, can you please do a "how to apply nail polish" tutorial video for me, please? You always have such nicely painted nails! I'm sure your other followers would love it too! Smitten is beautiful. I like the close-up swatches of the nail polish. I can't find CVS near me. =( Thanks for sharing the pretties with us though! 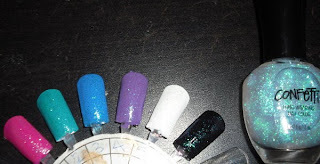 Would you say that Ice Ice Baby is a twin to Sinful Colors Pearl Harbor? I feel so-so about the close up swatches. Lots of times they turn out blurry and in my opinion, seeing the color next to the skin helps to show the true color a little better.